It's 05:14 in Princeville, USA right now. 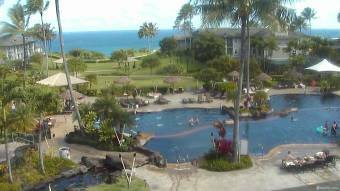 The Westin Princeville Ocean Resort Villas A nice livestream over The Westin Princeville Ocean Resort Villas. Princeville, Hawaii: Hanalei , Kauai, 0 miles away. Kapaa, Hawaii: Islander on the Beach, 13.2 miles away. Lihue, Hawaii: Kauai Marriott Resort, 18.2 miles away. Koloa, Hawaii: Sea View, 22 miles away. Waimea, Hawaii: Weather in Waimea, Hawaii - Kamuela View, 99.1 miles away. Kapolei, Hawaii: Kapolei High School, 110.2 miles away. Honolulu, Hawaii: Oahu's South Shore Surf Cam from Ward Village, 124.5 miles away. Honolulu, Hawaii: Diamond Head, 124.5 miles away.